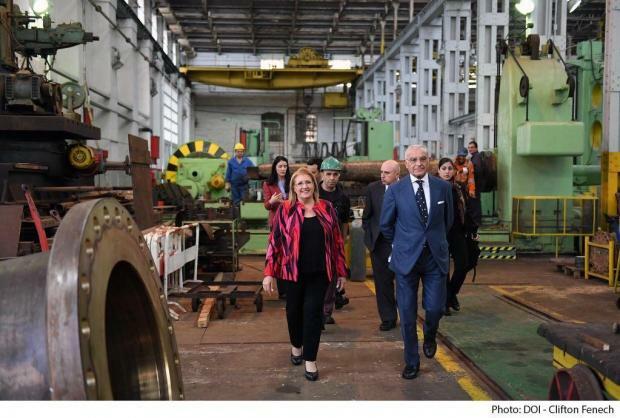 President Marie-Louise Coleiro Preca's eyes shone as she toured the workshops and docks of the Palumbo Malta Shipyard with CEO Antonio Palumbo during a recent visit. Ms Coleiro Preca mingled with ease among the workers and took a genuine interest in their work, remarking that she was happy to see the shipyard thriving. After the visit Mr Palumbo gave Ms Coleiro Preca a substantial donation to the Malta Community Chest Fund ahead of the Boxing fundraiser L-Istrina. The shipyard is also one of the main sponsors of a grand concert being held next weekend under the patronage of the President. The concert will feature world-renowned violinist Uto Ughi and the Filarmonici di Roma at the Mediterranean Conference Centre in Valletta on Saturday, December 2, at 7.30pm. Ms Coleiro Preca thanked Mr Palumbo for his active support in the community and congratulated him on the shipyard’s illustrious achievements in such a tough industry. Booking for the concert is now open through www.mcc.com.mt.